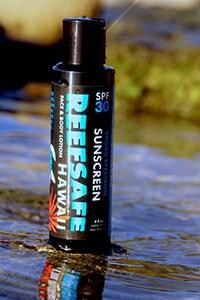 ReefSafe Hawaii is a 100% plant and mineral based broad spectrum sunscreen. ReefSafe Hawaii is safe for the ocean's reef and sealife and is oxybenzone free. ReefSafe Hawaii is product insured and available for bulk purchasing. If you are interested in our wholesale prices and purchasing options, please contact us.